Click here to learn more about UniFirst! Arrow Uniform’s national account management programs have grown over the past decade from a single account to countless nationally based satisfied customers. Our program started from the request of a customer, asking us to take our service first philosophy and oversee all of their national locations under a copy exact model. Over the years we’ve built a national account program around the same principals you’ll find in all of our programs, “Exceed your Customer’s Expectations” and “Put your Customer First”! We’ve been able to not only meet the original request, but add some of the largest accounts in the industry to our portfolio by building our program around the customer and focus on “Total Program Management”! Discover the difference in our national network, contact us today and speak with a national account executive. 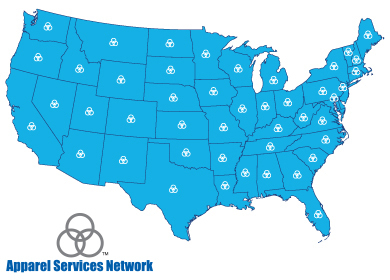 Click the image to learn more about the Apparel Services Network. National Coverage with Local Attention! We’ve searched long and hard over the years to find local service providers that operate under the same commonalities as Arrow Uniform, giving your locations exceptional service and local attention while operating under a defined managed program. Our network of local providers truly gives you the best of both worlds and while competitors tend to fail to get to 100% compliance, giving your local facilities a choice can help solve that problem immediately. Allow our experienced account managers to build a profile around your specific goals and objectives and then carry them out. The account profile will provide all the details important to you including product consistency, pricing consistency, program compliance and service requirements. We have built our program around a “Proactive Approach”. In connection with our state of the art technology, we can provide tools to help better understand your program and help you reduce your costs. Whether it’s tracking garment turn in, laundering history, repair history or program compliance we can provide you the tools to help you reach your goals. One of the most common complaints we hear repeatedly is the inability to correctly consolidate the billing at a national account level. 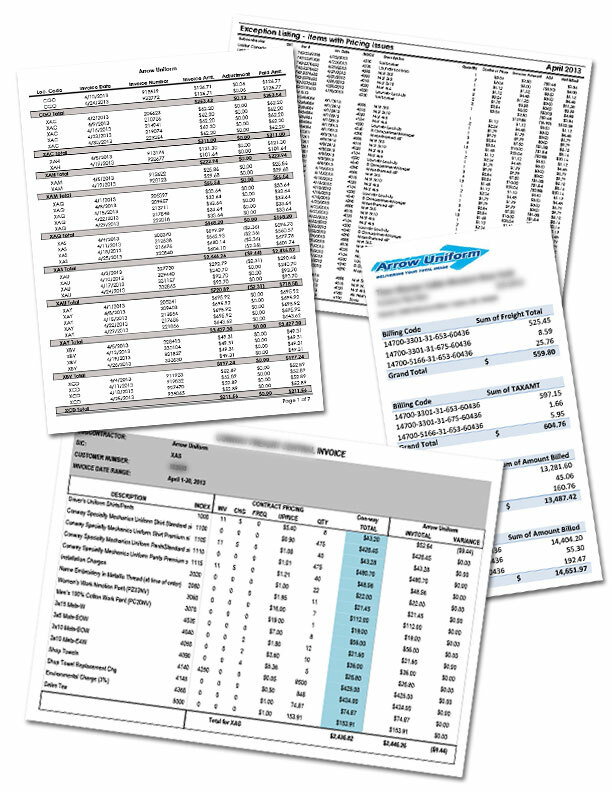 We’ve crossed this task off our list and put together billing templates that exceed the expectations of our customer base. We have dedicated billing specialists assigned to our national accounts to promote consistency and flexibility as your account grows. Allow us to audit and build exception reporting, ensuring you only pay for what’s on your agreement, regardless of the service provider. Arrow Uniform operates under a proactive approach by conducting “Quarterly Business Reviews” with each customer focusing on some basic metrics combined with customer specific goals and smart target objectives. We’ve been able to work with our customers to continue to refine the program while looking for creative ways to contain costs and improve customer service. "I understand your concern with hiring a unique company(s) such as Arrow and their National Account Network. I had the same concern when I interviewed them 5 years ago. At that time we only awarded them about 100 of our sites and a year and a half ago awarded them the rest of our sites, about 570 locations in 19 sites. It really is the same as a “National Company”. We have one point of contact for all the sites, we receive one monthly consolidated invoice and we have the same product in each of our sites. They will split the payments up and sent out to each of the other companies, we send them one check a month. They go above and beyond any of the “National Companies” that are out there. For example, Bob Evans decided that we wanted a particular walk off mat that was currently not carried by them. They did purchase the mat, along with all of the companies, for us. They will help you problem solve and save money. I can honestly say that this company is not out to make a buck off us today, but to make $100s over several years." This is an embedded Microsoft Office presentation, powered by Office Web Apps.